Mozilla on Thursday touted Firefox Quantum, the browser upgrade launched one month ago, as its biggest release ever and said early adoption metrics have been "super encouraging." But preliminary browser measurements taken by the U.S. government show only a small increase in Firefox's domestic usage since Quantum debuted on Nov. 14. That did not deter Mozilla, however. "In less than a month, Firefox Quantum has already been installed by over 170 [million] people around the world," Nick Nguyen, the company's top Firefox executive, wrote in a post to the firm's primary blog. "We're just getting started and early returns are super encouraging." While there's no reason to doubt Nguyen's 170 million Quantum installations, he failed to mention how the browser acquired such a huge user base so quickly. Unlike brand new software, which must start from zero installs, Quantum is, all branding aside, also the next iteration of Firefox, the November result of its every-six-week refresh. Mozilla may now label the browser as "Quantum," but it's also Firefox 57. Like all Firefox upgrades, Quantum/57 was distributed through Mozilla's long-standing automatic download and upgrade service, which retrieves each new version in the background and then installs it at the next launch. In other words, it had a big leg up at the start. Unless users rejected it in catastrophic numbers, the vast majority of copies of Firefox 56 would have been updated to Quantum within days of its release. The 170 million figure actually fits within a rough assessment of Firefox's global user base. Nguyen also claimed that Firefox Quantum/57 was "our biggest release to date," and said that it had made it to 100 million profiles - that's where the browser saves each user's bookmarks and settings - faster than any previous upgrade. More impressive was the next statistic Nguyen called out. "More users are coming from Chrome," he asserted. "We've seen a 44% growth in downloads from people who are using the Chrome browser compared to the same time last year." That Quantum is getting a look from Chrome users should be no surprise: Google's browser is, by a huge margin, the most-used on the planet, accounting for nearly 61% of all those run in November, according to Net Applications. If Quantum picked up new users, they would have been more likely to come from Chrome than any other browser. But the 44% increase Nguyen alleged was impressive because that figure was far greater than Chrome's own growth rate over the past year. Net Applications put Chrome's increase at a meager 1.4% during the last 12 months. If Mozilla continues to tempt a growing number of Chrome users into downloading Quantum, it has, at the very least, a chance at turning them into its users. The mobile downloads, which almost certainly rode the coattails of Quantum on the desktop, were another positive sign. Because the prime reason to download and install a mobile browser other than the default - Safari on iOS, Chrome on Android - is to sync bookmarks, login credentials and the like with what's used on a personal computer, the uptick in mobile Firefox downloads hints at users willing to do more than just kick tires, and may also have indicated switchers from a rival browser who armed themselves not only with the desktop Firefox but also the Android or iOS version for their phones. Nguyen said that Mozilla plans to "watch these numbers" and update them at some point in early 2018. Computerworld will as well, as part of its series of top-of-the-month browser reports. 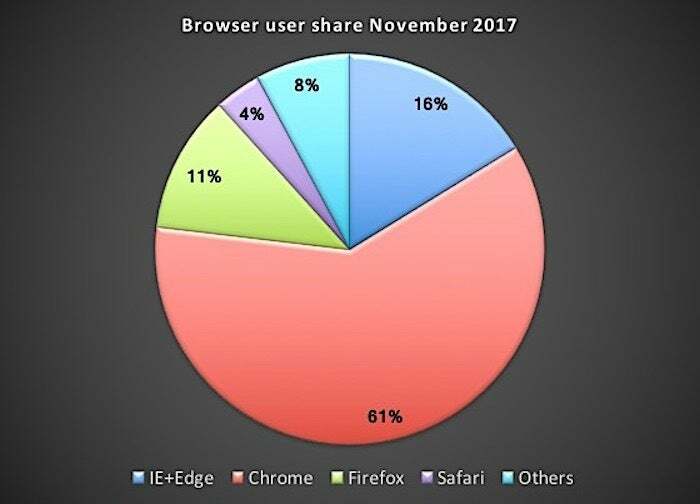 Microsoft's Internet Explorer and Edge browsers were used by just 16% of the world's online users of PCs in November and could soon be eclipsed by Mozilla's Firefox.